This is Memorial Day weekend, a time we set aside to remember, honor and reflect on the men and women who gave their all for their country. I have been doing some reflecting about the price that has been paid so that I can enjoy the freedoms I have in America. Having been reared in a Military family, I know the sacrifices that are made both by the one who serves as well as the family. The separation when the family member is deployed is so hard on the family especially children, I remember missing my father so much, and praying for his safety. I will be eternally grateful to the men and women who sacrificed their lives and for those who continually place their lives in harms way for these freedoms. Mr P and I make it a priority to pray for our Military Troops and their families as well as America. Please join us as we lift them in prayer daily. And this is how my day went..
My plans when I woke was to go, sit on the porch and have some quiet time, but for some reason, I was directed to the kitchen. I thought "Lord, you must have a reason for directing me here first, because I really want to spend some quiet time with you." I know it was the Lord leading me, because everything just fell in place, and was I able to even clean the refrigerator. I finished and was about to go out on the porch, when I saw this car drive in the driveway, I immediately recognized it, and here was my thought" OH! Lord not today, I have so much to do, and I don't really have time to visit." I was quickened in my spirit that God had everything under control, and not to be anxious about all the work I had to do. I decided to go with the flow that God was directing. You see it was a lady who likes to stop in anytime and visit with me, she is lonely and her life is very uneventful. Her health is not the best, so when she comes I always stop and spend time with her. After refreshments and a few chats, she decided she needs to leave. I offered her some fresh veggies and eggs, which she was tickled to get. After she left I was so thankful for our visit as I enjoy talking with her, and somehow I knew all was well. I went in and was directed to finish my work, and I was so amazed at the energy and speed in which I got everything done. I listened to BBN on the radio and was so ministered to by the music and teaching. Everything was completed and I had time to fix a nice dinner for dh and I, and as I sit here tonight I am tired but not exhausted. House back in order, and even better than what I had planned. How Awesome is God, He always has my days ordered for me.Some days I follow, but I hate to admit it, there are days when I don't. But the days that I do, I find that things go so much smoother. Philippians4:6-7~ Be anxious for nothing, but in everything by prayer and supplication, with thanksgiving, let your requests be made known to God:and the peace of God, which passes all understanding, will guard your hearts and minds through Christ Jesus. So much for writing A Simple Woman's Day book, yesterday, as nothing I planned happened other than getting the water heater installed. Yea!! LOL I m not complaining mind you because I got some other things done. lol. So I have now added the things I didn't do to my today's list. We had to run a fan to try and dry the floor and sub flooring. I am so thankful for no structural damage, my oak floor didn't fair so well. What did my parents and grandparents do. They didn't have hot water inside... why they heated water on the stove and put it in a tin tub, OHHH!! Okay Got It. I get my big pot out and the rest is history, clean body, hair washed, and computer time. Yea!! We went out for dinner, because Mr. Plumber didn't finish until late. Hubby did get a lukewarm shower. My grandmother used to say "Where there is a will, there is a way", how true. So for today, the broccoli will be cut, and froze. My mother called and wants to come for a visit, and will help with the broccoli, as I always share with her. Today I hope to get the house back in order. You know how it goes when you have people running in and out of the house. I am most thankful for the hot water. I never knew how much I used until I didn't have any. I really have been thinking about, and appreciating my ancestors and how much harder they had to work. A welcome sight for sure. Hope your day is filled with many blessing from our Heavenly Father. James 1:17 Every good gift and every perfect gift is from above, and comes down from the Father of lights, with whom there is no variation or shadow of turning. 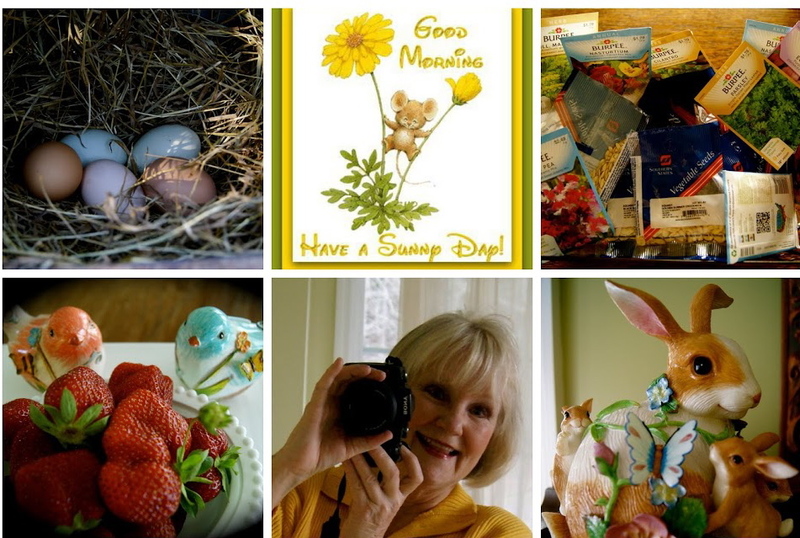 A special thanks to Susan for her inspiration to post my daybook today, please visit her blog. Outside my window.... cool and overcast, just received some much needed rain. From the learning room..... Please check appliances often to see how they are running. From the kitchen..... fresh veggies from the garden. I am wearing.... blue pants and green top, nice combo. huh! I am remembering.... what a special time we had with daughter and her family this past week. I am creating..... new flower pots for our porch.that is if we get the porch renovation completed soon. I am going to the garden to do some work, in hopes that the hot water will be on when I come in for a shower. I am reading... My Bible! I am hoping.... to see our granddaughter Lauren graduate from high school this weekend. I am now hearing the sander on our porch by my dh and a friend! I noticed my hummingbirds have come back for a visit, and I am so thankful for this. On my mind... Looking forward to spending time with family. Pondering words..... "The charm of a house, like the charm of a person, is an outward manifestation of inward grace"... Emily Post. One of my favorite things to do...... is to go sit on the porch late at night with my dear husband and listen to the animals say their goodnights to each other., while pondering over the events of our day. A few plans..... finish my ironing, and make ready the house for trip. A favorite photo.... I took this a couple of weeks ago, as it was passing over the farm. I am like a child in the fact that I enjoy such sites. Monday is usually filled with catching up on laundry and vacuuming, and today was no different, except as I was vacuuming I decided to clean the little room underneath the stairs where we have the hot water heater, and storage area. Low and behold I looked down around the heater and there was water and it looked like the floor was warped. With a phone call, the plumber was out and made a diagnosis of a leak. Oh! really!! So we are having to drain the tank which is taking it seems all day. lol. And tomorrow we will be having a new one installed. Needless to say our budget this month did not include purchasing a new hot water heater. I also was trying to find something to be thankful for about this situation, and I realized that I am very thankful I found it sooner rather than later. I am also very thankful for the rain we got last night and today. Thank you for praying with me. So how was your day? I hope it was filled with many blessings. Please enjoy your evening. Since we have come home we have been busy trying to catchup. (Do we ever really catchup? )the drought hasn't helped as we are in dire need of rain, please help us pray for some. I am so thankful for irrigation systems that dear hubby has put in. The task, of which fruits I am enjoy this most blessed day, is the cleaning of the screened porch off of our bedroom. I don't know about you but once a job is completed I always ask myself, "why did I put off doing this?" Because I look back and see the results and say, "now that wasn't so hard." Anyhoo I am thankful to be able to sit on this nice clean porch with this computer and write this post. I like to come here early in the morning when everything is so fresh and clean with my Bible and have my quiet time with the Lord. The sounds of the day are music to my ears; birds singing, a crow cawing across the pond, a mother cow calling her calf to feed, ( even as I am now hearing). I also like to come here at the close of the day with my dh and share. And the sounds I hear are quite different there is a quietness about the farm, so soft you feel as though you must whisper so as to not wake the children of the night. I must say one of the most special times of my day. Now! Why did I procrastinate a task, that brings me so much joy? Do you procrastinate? Please tell me I am not the only one who does this. Yesterday was completely the opposite. LOl. I think they call it LIFE. I got everything done on my list for today and a few extras. Don't you just like that word "EXTRA"
Looking out the dining room window, this morning, my dear friends keeping those bugs out of my beds. Here they are galavanting across the front lawn. I enjoy all of the animals that live here on the farm. Please excuse this messy post, my computer is acting up.